What a night out? Zico's has become quite an attraction in Pattaya city. When the two Brazilian dancers are doing their shows (2000 and 2100) crowds congregate after their shopping at the central plaza. 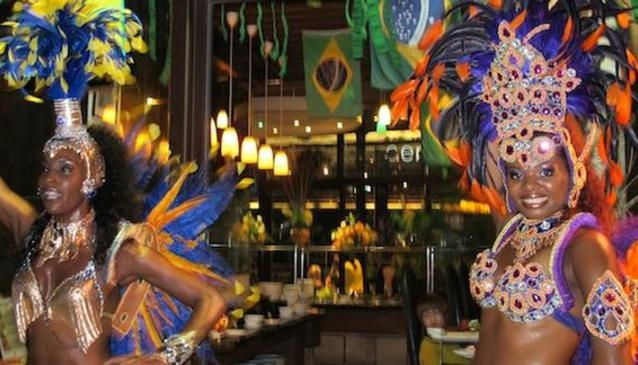 Between bouts of wonderful Samba dances , in which you can participate, you can enjoy brazilian and international cuisine from the buffet. Grilled and roast dishes are prevalent all washed down with a cool glass of wine or one of the exotic cocktails on offer. Included in the evening buffet are Red snapper, Salmon, Beef,Lamb, Duck and chicken. You can also help yourself from the Salad Bar. The meat is carved from the joint at your table. All for 999 Baht (2 Hours) which includes a cocktail.